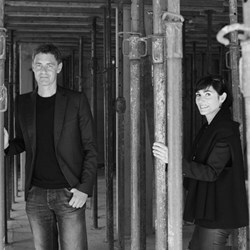 bergmeisterwolf architects was founded in 2009 by gerd bergmeister and michaela wolf in brixen. gerd bergmeister (brixen 1969) studied at the IUAV in venice and leopold Franzens university in innsbruck. michaela wolf (meran 1979) studied at leopold franzens university in innsbruck, milan politechnic and architectural association in london. architecture is a process of development, constant analysis and research, continuous modelling and shaping. bergmeisterwolf works on images, forms and landscapes: "you shall not build on one place, but you shall build the place". the practice has been extensively published, received many awards and won several competitions for national and international projects, combining these activities with workshops and frequent lectures in universities and architectural events in italy and abroad, as well as being members of the jury for several major architectural awards.